Hey guys. I'm working on a 1962 Coquette, and need to pretty up this part. What is it called? It obviously goes with the top ss glass guide, but I really don't know its purpose or name. Seems like the rubber bumpers protect the apron on the top of the playfield when servicing. Once I know what it is I can either get a new shiny one or have it refinished. 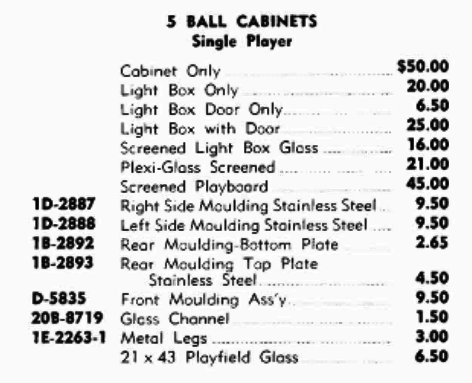 You can look in the parts catalog on planetarypinball.com, I guess it is one of the "rear moulding" parts. Give it a bath in Evaporust and see where you are at! Yeah that's the next step. I think the pitting will be pretty bad, but not enough to pay for chroming. That is the trim part that sits under the playfield glass at the top of the playfield. Four screws hold it to the back of the cabinet. I get these rechromed for $30. PM me if you want one. I think I have that one.. the later games had tabs at each end.